While his swing is nearly flawless, Louis Oosthuizen’s grip is a bit unconventional. But only a bit. 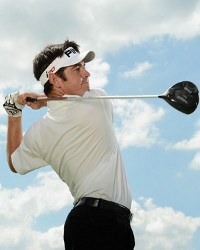 The 2010 Open Championship winner and 2012 Masters runner-up, Oosthuizen is a 5’10”, 180-pound ball of power and precision. His swing is a virtual study in perfect positions, from posture to plane to hip and shoulder rotation. 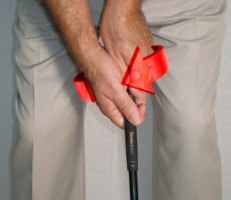 Oosthuizen’s grip is only slightly off what a golf teacher would call ideal. His hands are turned into a strong position, with a noticeable “cup” between the back of his left hand and wrist as his glove’s logo points right of target. Oosthuizen’s right hand essentially mirrors his left, with the “V” of the thumb and forefinger directed just inside the right shoulder. 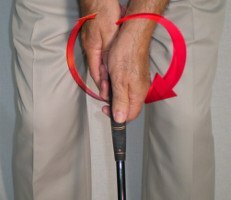 This grip method helps Oosthuizen generate prodigious distance, especially for his size. In 2014, he ranked 21st on the PGA TOUR with an average drive of 300.5 yards. Solid as he is from tee to green, the South African has had his struggles with the putter. 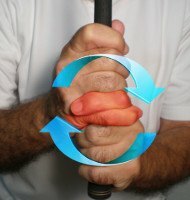 That’s why he’s gone back and forth between grip styles – conventional to cross-handed – so often in recent years. As of early 2015, Louis Oosthuizen’s grip is the latter, with the fingers of his left hand overlapping those on his right. “My putting strategy is simple,” Oosthuizen told Golf Digest. “If you're not making putts, don't be afraid to change your technique. That's how I avoid slumps.” Words of wisdom from a major champion.